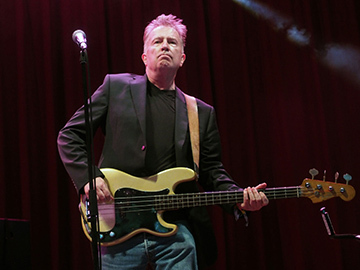 Having entertained us in 2015, Tom Robinson returns to Wickham on Saturday 4th August. He shot to fame with the top 10 hit 2-4-6-8 Motorway and Glad To Be Gay. A UK songwriter & broadcaster first known in the 1970s as a musician & LGBT activist, Tom and his band were also early supporters of Rock Against Racism & Amnesty International. Between 1975 & 2001 Tom released 19 albums with various bands, and had a solo hit with the song War Baby. He has also co-written songs with Elton John, Peter Gabriel & Dan Hartman. He has hosted programmes on all BBC national radio networks and won three Radio Academy awards. He currently presents shows on BBC Radio 6 Music and hosts the new music blog Fresh On The Net. At age 16 I was in the grip of terminal depression - and my life was only saved by a visionary teacher and healer called George Lyward. Finchden Manor, the community he founded in Kent offered troubled teenagers like me a haven of respite - and gave me back my life at a time when all I'd wanted to do was throw it away. Danny arrived there two years after me as a nervous 14 year old on the very day our most distinguished old boy - Alexis Korner (father of the British blues) - played an impromptu concert in Mr Lyward's study. Danny found himself rubbing shoulders with 20 or 30 unkempt youths crowded into that oak-panelled sanctum, held spellbound by one man and a guitar. That evening, he later told me, gave him a first glimpse into the world of possibilities that music might have to offer. Shy, yet sociable. Naive yet knowing. Danny soon made friends who to this day still remember him with warmth and affection. He was good at football, a natural at amateur dramatics, and quickly acquired a battered third hand electric guitar. The apparition of Danny (with flowing locks and Jimi Hendrix headband) practising his Guitar Hero poses was a source of much merriment - because at that point he had yet to learn how to play the thing. Older boys like myself who fancied ourselves as musicians, found ourselves constantly badgered to show him basic chords and riffs on the instrument. As anybody who has known Danny at any point in his life will remember - he was nothing if not persistent. Fast forward 7 years - and with Finchden long behind us - the 21 year old Danny has heard that I'm forming a band in London. Luckily for me punk rock has just erupted - so the ability to sing in tune is strictly optional. Likewise the ability to play more than a few chords on the guitar. So it doesn't take much pestering for Danny to become a founder member of the modestly named Tom Robinson Band. Then, after a first couple of gigs together, it slowly begins to dawn on me that Danny is not only a born performer but can actually play the guitar. And his playing isn't competent... It's outstanding. Within a few weeks we have recruited a teenage keyboard genius called Mark Ambler, a percussive human whirlwind inexplicably named The Dolphin, and a hit record follows 9 months later. Over the next three years music fans around the world will be smitten by Danny's incendiary guitar solos and extraordinary stage presence. He soon earns recognition as one of the most gifted English guitarists of his generation. He also becomes known as a staunch supporter of Rock Against Racism, eventually playing to 80,000 people at their Carnival Against The Nazis in London's Victoria Park. And yet... Be careful what you wish for. Our band's rapid rise to commercial success in 1977 soon brought unimaginable pressures and emotional stress for all four of us. None of us behaved well, least of all me. And so, even as our collective career took flight, the band began falling apart. By the time TRB fizzled out two years later there was only Danny and me left - and even we weren't speaking to each other. Like all of us Danny had his troubles, sometimes of his own making, but none the less painful for all that. He also had a big generous heart. Like any of us he had an ability to exasperate those who loved him... But he also had the (much rarer) lifelong ability to inspire that love... even among those he exasperated. Four decades after making those early records with Mark, Dolphin and myself, Danny's legacy is still remembered with warmth and wonder. Over the last 36 hours there's been an outpouring of tributes to his achievements - and grief at his passing: from friends, fans and fellow musicians around the world, in their hundreds. And, five decades after first encountering that nervous 14 year old full of hope and promise, I share the devastation of everyone in this room that he's no longer with us. "I’ll remember him with a smile and one of those incredulous faces you pull every time you had the pleasure of hearing him play. As in: WHAT A TALENT!! HOW IS *THAT* EVEN POSSIBLE?? From the opening tsunami of Up Against the Wall to the delicate beauty of his solo on Too Good to be True... What a touch he had. Danny gave us all a love of music and encouraged each of us to pick up a guitar ourselves..."
Alexander Daniel Kustow may be gone, but he won't be forgotten for as long as any of us draw breath.